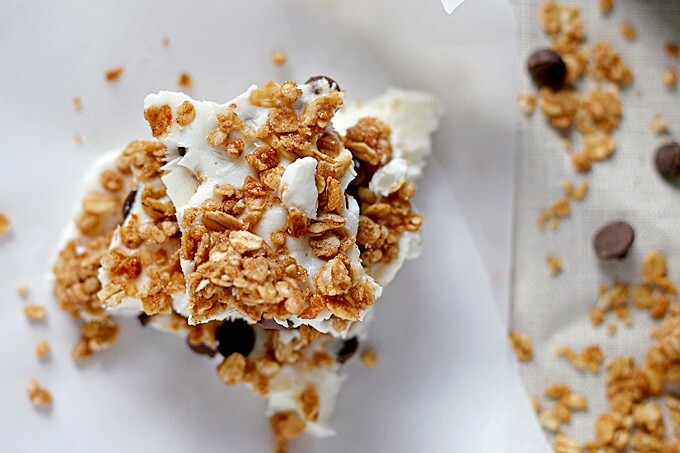 Chocolate chip granola frozen yogurt bark made with non-fat Greek yogurt and honey – the perfect quick snack or breakfast! 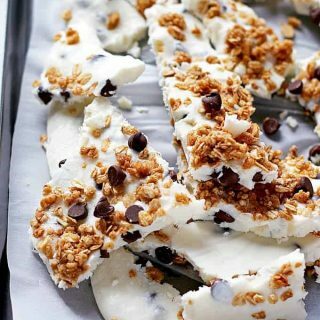 Whip up a batch and keep it in your freezer. Every time I go to the grocery store, I walk down the snack aisle and get cravings. For fruit roll-ups, fruit snacks and granola bars. I used to get so excited when my mom would put them in my lunch when I was a kid. It was a surprise each day – in a way I’m glad I didn’t pay attention when she made my lunch each morning. I’m also glad she made my lunch and didn’t just give me lunch money. Happy memories. Back to the snack aisle. And the granola bars. Back when I was a kid there were 2 or 3 options. 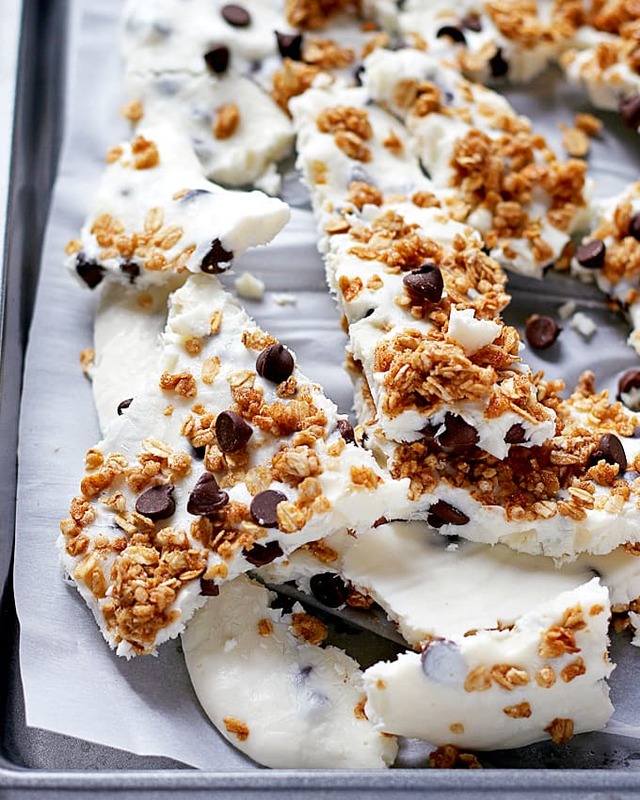 You could get chocolate chip granola bars, honey and nut bars and probably another one. I only paid attention to the first two because I loved them. Now I buy a box and eat it for dinner. Bad, bad habit but they are totally kid sized portions and I am an adult. Also, the snack aisle has about 20 more varieties than I remember and it’s overwhelming. When feeling ‘whelmed, eat a granola bar. One of the newer varieties I saw the other day had a yogurt bottom. Ummm… YUM. 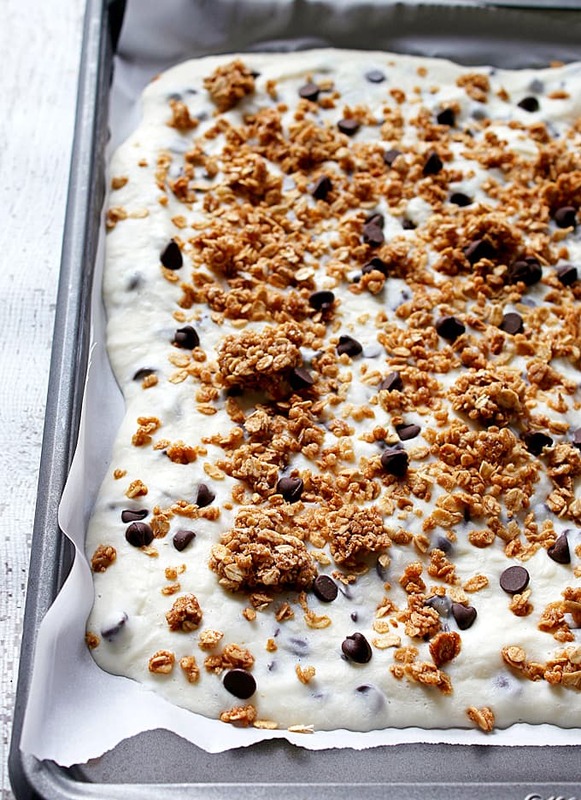 I tried to make homemade yogurt-y granola bars and failed miserably. I will attempt again but in the meantime, I have this awesome snack instead. 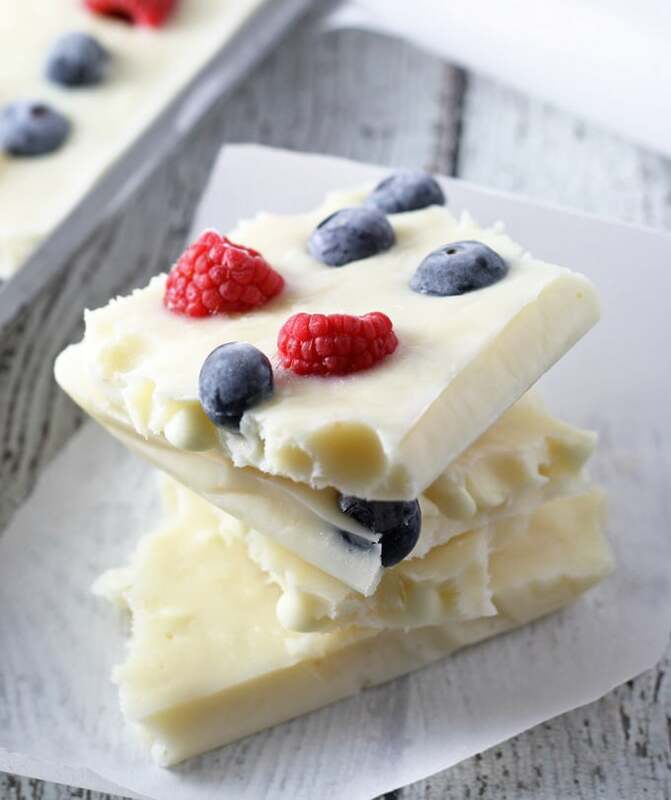 Last summer, I made yummy berry filled frozen yogurt bark and I used that as my guide for this chocolate chip granola frozen yogurt bark. It’s a little messy as it melts, so break it and eat it fast. You are going to want to anyway, because it’s delicious. You can use any granola that you want – you can make your own (use my pumpkin spice granola!) or store-bought. Flavored granolas will change the taste a little bit – experiment and make a bunch of batches to see which you like the best! 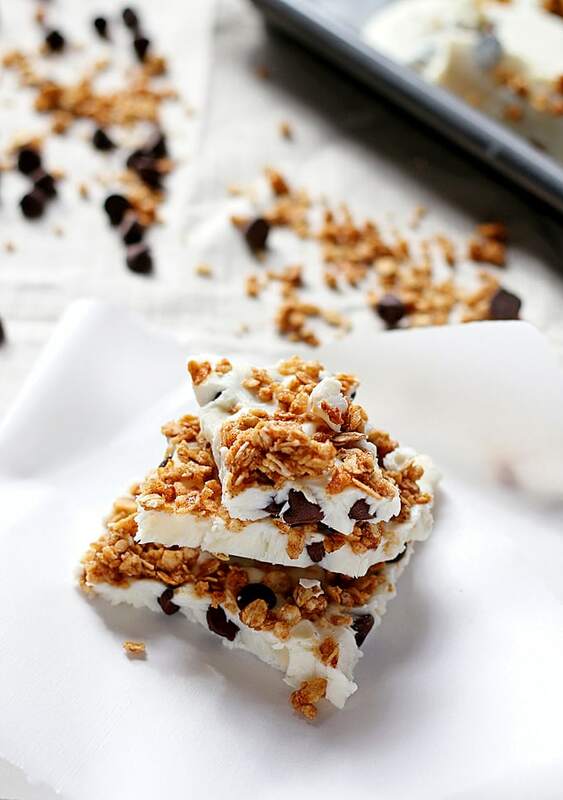 Chocolate chip granola frozen yogurt bark made with non-fat Greek yogurt and honey - the perfect quick snack or breakfast! 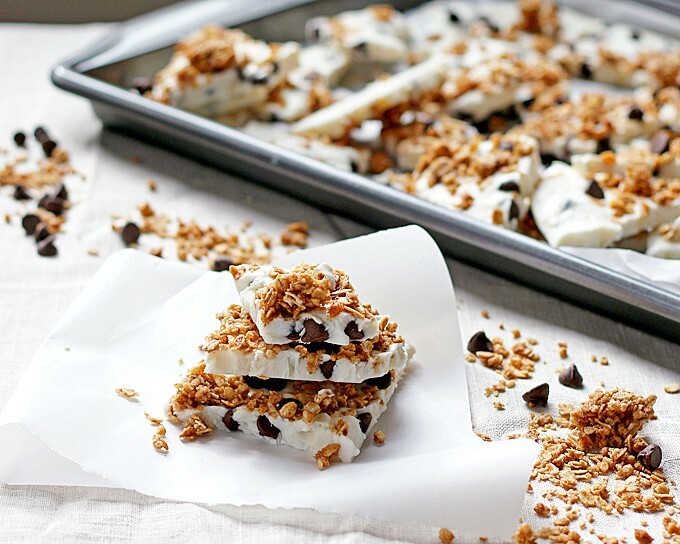 Whip up a batch and keep it in your freezer. In a medium bowl, combine the yogurt and honey until well combined. 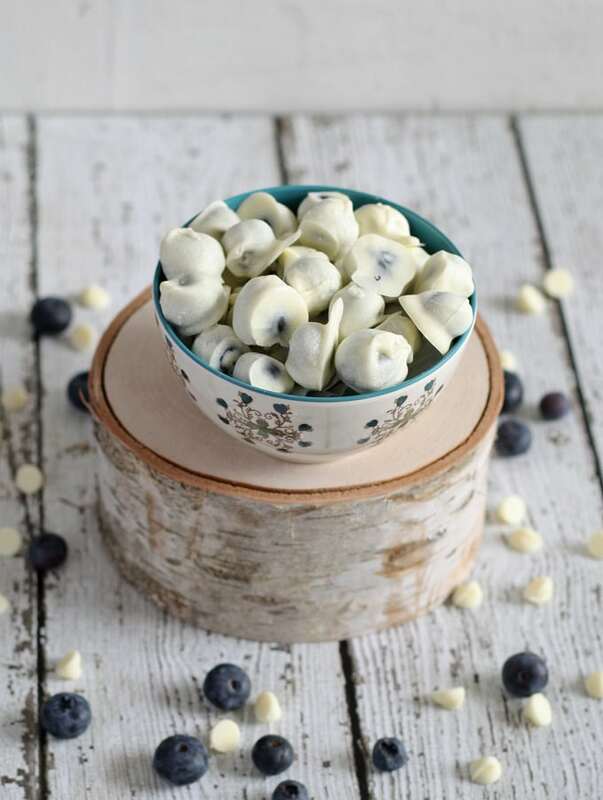 Using a spatula, fold in 1 cup of chocolate chips. Line a cookie sheet with parchment paper or a silicone baking mat. Pour the yogurt mixture over the cookie sheet, smoothing with your spatula until the layer is even. 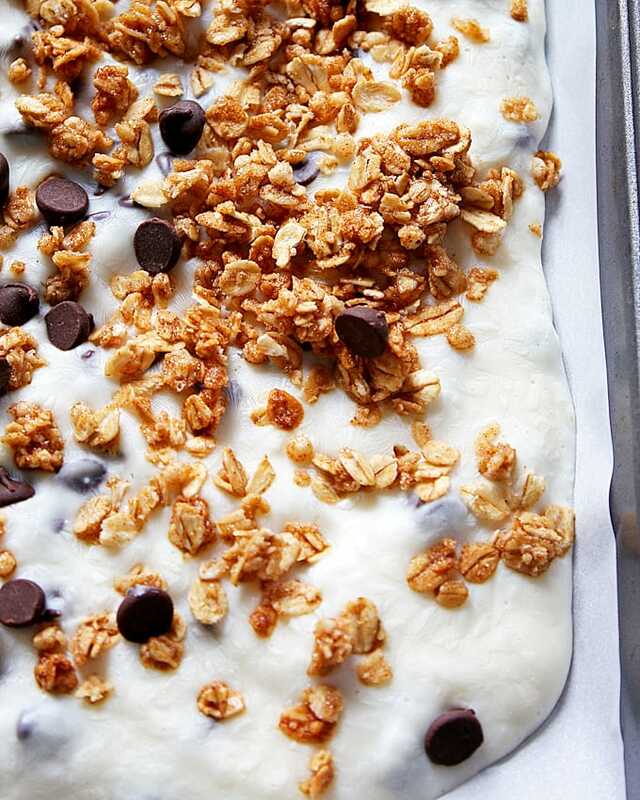 Evenly distribute the remaining chocolate chips and the granola over the top of the yogurt mixture. My kids would go CRAZY for this. Perfect for the warm weather months ahead! What a cute (but healthy) idea! Love it and I’m sure kids would too! This is such a fantastic idea and a great way to get my kids excited about yogurt again!! I love this!! Love how healthy, love how decadent tasting. Making for my kids! I so, so, soooo love this!! Like mucho! Awesomest bark of ever. I straight LOVE this idea! Seriously brilliant! My wife and I made this the other night. It turned out fantastic! Thank you! What a great idea! Need thought of making this. This bark looks delicious!! What an interesting idea for bark!! This looks so good! These look so good and I bet they’re just as delicious as they are healthy. I’m always on the look out for a quick and healthy breakfast, and as you said in the beginning, this is a great option. I’m definitely sharing this on my social media. I can’t wait to try it as well. Thanks so much for sharing this on #shinebloghop, Jenny! What an intriguing idea. Never would have thought of breaking it up like bark like this. Thanks for sharing on Creative K Kids Tasty Tuesdays. I hope you will join us for the next party. I’ve been making homemade granola. This would be a perfect snack recipe to try next. Thanks for sharing at the Inspiration Spotlight party. Pinned & shared. My kiddos and I would love this! What a great idea! I have everything on hand to make this and will be making it with my kids this week over spring break! Thanks so much for sharing! You just made me remember how much I LLOVVEDDD chewy chocolate chip granola bars. I can just imagine how much sugar was in those! These are much more my speed. Plus frozen! Major bonus. I will have no problem eating them up before they start to get messy. Thanks for linking up at Saucy Saturdays, Jenny. These are so mouth-watering, I just showed this to my little girl and told her that I’ll be making it for her this weekend. She was so mad that she convinced me to prepare it right away. And guess what – we together did and it came out fantabulous. Granola is already on top of her fav foods chart and this one is like a dream come true hence. Truly loved it!